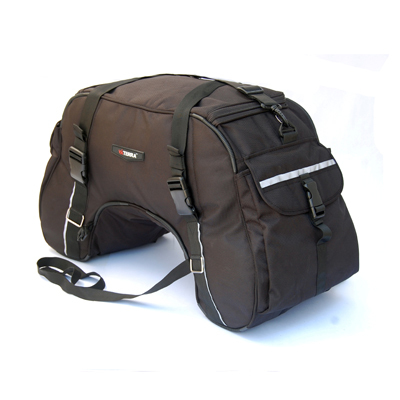 Sometime last year I noticed a company in India introduced a new tail bag called “The Claw”. It had high quality materials (heavy 1680D fabric and 3m reflectors), a great design, competitive price (around $50 USD) and a size that was perfect for a 2-3 day trip. The problem was they didn’t ship to America. A short time later I happened to have a friend traveling through India that was kind enough to pick one up for me. Once it was home I was excited to give the product a test run. The opportunity came on my 3 day trip to Canada last Fall. It turned out to be a great choice. That ride was rocky and bumpy, but the Claw held up to its name staying mounted just where I put it. My tent, sleeping mat, food, and cooking supplies all fit neatly inside. Only my cold weather sleeping bag was attached outside the Claw to the rear. Although the Claw came with a waterproof cover I decided to spray it down with 3M waterproofing instead to save the space the cover took up. The Claw comes with strapping, but I choose to use Rok Straps attached to the Claw’s d-rings instead. The front straps went to my rear foot peg mounts and the rear went round my tail rack. It worked well. Everything stayed dry even though we experienced a heavy rainfall and frost. 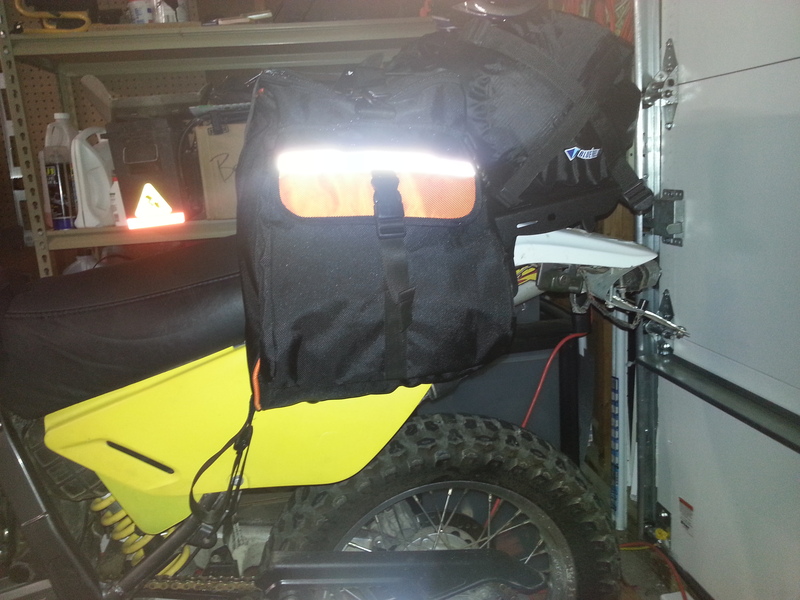 I imagine with the myriad of strapping options the bag provides it could be mounted to many different bike models. The good news is that Viaterra now ships this bag to the US. I believe, with shipping it can still be had for under $100. More colors have been added and a “Mini” version as well. Compared to similar bags from Giant Loop and others this is a steal. My only nitpicks are that the included plastic strap buckles don’t hold tight enough (swap to rok straps like I did) and the sides of the bag could be a bit deeper (to keep weight lower to the ground). This product is not well advertised in the states but I recommend you give it a look when considering soft luggage for your next excursion. Click here to purchase and see more photos and video. 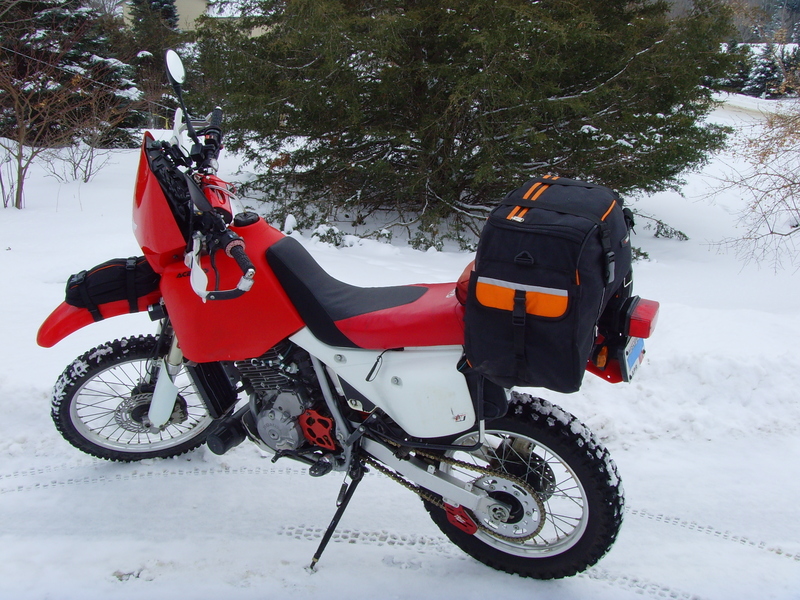 You are currently browsing the Minnesota Adventure Riders blog archives for February, 2014.